Re-Watchterpiece Theater is a series that explores the organic way that attitudes about films change after you watch them a second time, a third time, or more, further down the line than the original viewing. Thanks to Cinema St. Louis and the Webster University Film Series, I had an opportunity to re-visit Marcel Carnés poetic realist masterpiece, Children of Paradise (1945), over the weekend. It’s a film held in very high esteem, often ranking at the top of French film lists. Cahiers du Cinéma placed it as the 9th best film ever made, regardless of nationality or genre, in 2008. It’s often referred to as “the French Gone with the Wind“. I had it at #10 in the first iteration of my 50 Greatest French Films list, and then it fell to #28 in the second iteration. Seeing it on the big screen would surely give me a proper context of the film. I first saw Children of Paradise in 2008. It’s funny how people see things through their own personal prisms. At that point, I was at my peak of Bergman fandom. So when I watched Children of Paradise, I was reminded a great deal of Bergman’s Smiles of a Summer Night (1955). Both were period pieces, both swung back and forth between weighty drama and comedy, both featured sexual frustration prominently, and both featured several men and women vying for each other’s affections. Not that I thought that one influenced the other. Far from it. It’s just that having already seen Smiles of a Summer Night led me to recognize the rampant sexual frustration also put on display in Children of Paradise. And on those grounds alone- the similarity to Bergman- I loved it. The problem here is that I had no clue about poetic realism at the time. I didn’t know a whole lot about postmodernism and breaking the fourth wall. And while I knew quite a bit about the Nazi occupation of France, I wasn’t looked at Children of Paradise through those eyes. All of that has changed since 2008, and those facts enhanced my second viewing. It’s also worth adding that this screening was accompanied by an introduction from Joe Williams, film critic for the St. Louis Post-Dispatch; a discussion led by Williams after the film; and an introduction by Cliff Froehlich, Executive Director of Cinema St. Louis. This also added a great deal to my appreciation. Before the film, Joe Williams mentioned that there are six forms of artifice represented in the film. I can’t actually recall all six, but I can count mime, acting, modeling, and playwright. Williams pointed out that the film’s audience (the actual audience in the movie) counted as the seventh. Each represent a form of ruse, one character or series of characters after another who put on a mask of sorts to represent themselves as something other than what they are. That’s important because the film itself was made during the Nazi occupation, an era in France when paranoia ran rampant as citizens desperately tried to avoid being identified (falsely or otherwise) as either a collaborator or a resistance fighter. Identification in either category might have resulted in becoming a social outcast or, worse, death. In fact, Arletty- the film’s central female protagonist- was pegged as a collaborator not very long after Children of Paradise was released. The point regarding artifice is that the film carried a deep anti-Vichy, anti-Nazi message about acting in one way to avoid the treacherous behavior of your peers while living in a state of paranoia. Garance represents the French ideal (played up in an early scene where she portrays a beautiful statue), in opposition to the ideal Nazi female; Frédérick is symbolic of the collaborator, constantly changing masks; Baptiste is the Frenchman who has lost his way, and lost his heart, during the war; and Lacenaire (the thief) and Count de Montray each represent the Nazi invasion. This anti-Vichy message is even reflected in the film’s title, which loosely translates as “The Children of the Gods”- “paradise” in French theater is the balcony, the cheap seats set aside for Paris’ poor. 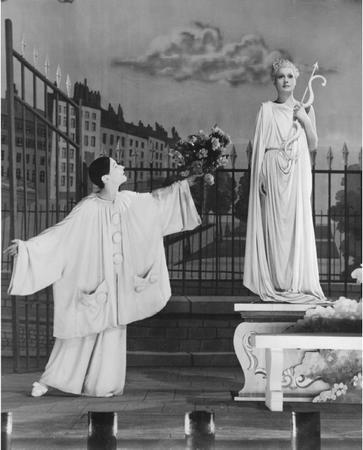 Characters throughout the film acknowledge the poor citizens of Paris, indirectly, by referencing “the Gods”. Baptiste falling for the statuesque model, Garance, mirrored on stage. What I found fascinating about The Children of Paradise the second time around is how deeply layered Carné made his masterpiece. The film tells the tale of four men all in pursuit of one woman. One is an aristocrat (Count de Montray), one is a mime (Baptiste), one is a notorious thief and murderer who doubles as a playwright on the side (Lacenaire), and the last is a famous actor (Frédérick). On the surface, we see their interactions and their pursuits of Garance, the woman. Along the way, the film is peppered with the on-stage performances of Baptiste and Fréderick, and Lacenaire’s pivotal actions in the film are- so he says- represented in one of the plays that he has written. What happens on stage constantly mirrors the action off the stage, regardless of which performer is on stage. It helps blur the lines further between their stage persona and their real life behavior. 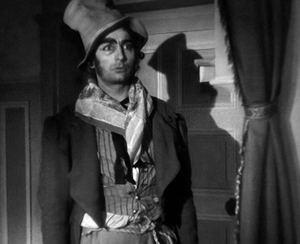 Something else I noticed this time around- and Joe Williams pointed this out in the discussion after the film- is how frequently Children of Paradise breaks the fourth wall. And that simply wasn’t done in 1945. If anything, it’s more of a characteristic assigned to the French New Wave, a movement that rebelled against films like Children of Paradise. Actors look directly into cameras and reference the audience (in this case, both the filmgoing populace as well as the audience in the film’s fictional theaters). The most notable example happens at the opening of the film’s second half. Frédérick breaks character during his play, joins the audience, continues to act along with his peers still on stage while proclaiming first to be Frédérick (not his character’s name), then shifts back into his character. It all ends when he identifies “the true authors”- the play’s financiers and writers- in a massive effort to embarrass them. 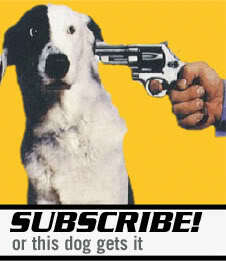 The clip can be found here, on TCM’s website. It’s humorous, it’s clever, and it bears the drama of the Vichy/Nazi allegory. In short, it’s as representative a scene as you’ll find of the film’s genius. After my second viewing, I can safely say that I have a much, much deeper appreciation of Children of Paradise. I’m not going to spoil my list and tell you where it will rank when I release it in a few weeks, but I will say that it has climbed back up the ladder from last year’s #28 ranking. The funny thing is that I loved Children of Paradise the first time I saw it. I loved it again the second time around, although this time it was for much different reasons. That I could find so many reasons to appreciate it speaks volumes for the quality of Carné’s work, an absolute masterpiece. I loved this film when I watched it, too. It’s the fastest long movie I’ve ever watched–I couldn’t believe it when it ended. You can pace along with the film, for sure, if that makes any sense. The shifts in the screenplay were evident in a way that you could play along. I saw this a long while ago but really enjoyed it. I still remember it fondly. It does seem like such a masterpiece, and with elements and styles way ahead of its time. I definitely want to see this again. And yet, completely rooted in the past as more or less the final Poetic Realist film. Now THAT’S loving a film. Sorry to nit pick, but you wrote that Arletty was suspected to be a collaborator, and that Hammersmark was a reference to her? Isn’t Hammersmark the opposite of Arletty? A german who fights against the Nazi regime? Maybe I am reading it incorrectly. Great post none the less. It was something that came up during the pre-film discussion, but you’re absolutely right. I’ll remove that bit. 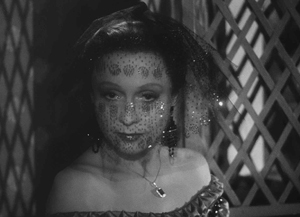 The thing with Arletty is that she was pegged as a collaborator… simply because she slept with a German. What a crazy environment France had to be during those years. When I first watched this film I was sure I would get bored and I entered into it without real interest. But I loved it very much. However, with time it felt like it’s not the greatest film of all time but a masterpiece of sensivity and beauty but I don’t know if I’ll ever re-watch it. Nice teasing for your upcoming list mon ami! I had forgotten that it was 3+ hours long, and had I remembered it, I might not have seen it on the big screen. Most of the films I’ve chosen to see for the film series are films I haven’t seen yet. This one just felt like it deserved a re-watch. I’m glad I did.